I got in from Japan yesterday and dove headlong into the blur of jetlag. By now I’m pretty good at the auto-pilot chores and the mindless digging out from the pile of things accumulated in my absence. It’s not just jetlag that makes it hard, but the more whole-body confusion that results from longing to be back where I just left while trying to be present here and at the same time plan for the next trip, which is only a month away. Less jet-lag and more nomadic dissonance. Hokkaido was amazing. Last time it was wildlife, this time short lenses and tripods and standing in waves or up to my waist in snow. Evenings were spent with friends, drinking sake, singing karaoke (we did this once: that was more than enough for most of those involved. (Toto, I apologize for the horrors I visited upon your beautiful song, Africa.) We slept those nights off in nice hotels, most of them with lovely food, many of them with traditional rooms and futons on the floor. And each morning we were back at it, lugging gear to the bus, then to the beach, stopping once in a while to refill supplies of weird-flavoured Kit Kat bars and sake at convenience stores along the way. 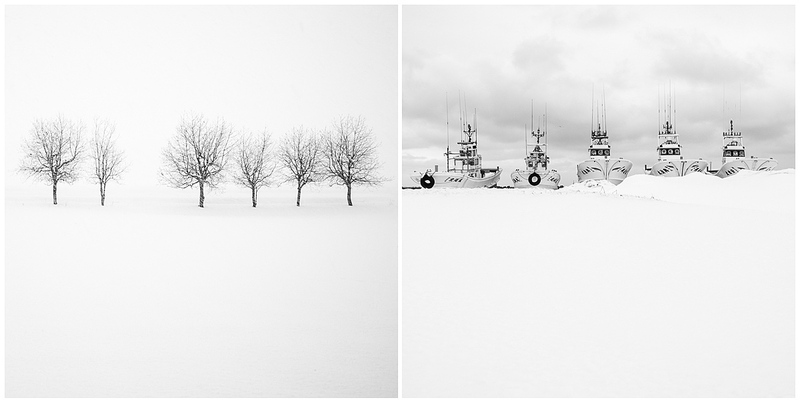 This time I shot a couple series of images – one square and black and white, the other (like the top image) in a soft warm/cool palette, and yet another of colourful abstracts of from the fishing boats, which I’ll post in a couple days. There’s something incredibly elegant, simple, and graphic about Hokkaido, something that feels particularly wabi-sabi about the place, which is the idea that I had bouncing around in my head the whole time. “Wabi-sabi,” writes Leonard Koren on the back of his book, Wabi-Sabi for Artists, Designers, Poets, and Philosophers, “is the quintessential Japanese aesthetic. It is a beauty of things imperfect, impermanent, and incomplete. It is a beauty of things modest and humble.” That idea, or my incomplete understanding of it, was behind the images I made on this trip. I’ve only just started pairing them, editing them down, but the work already seems on some level to have succeeded. The images feel, to me, earthbound and rooted, Japanese-inspired, but universal. Coming days are full of chores and waking up (unwillingly) long before the sun. My next assignment is in Kenya for the Boma Project, and between now and then there’s the pile of things that fills the days of most photographers I know. But I get to be surrounded by photographs, and there’s nothing more I’d rather do. Except seeing the world, but that comes soon enough. Before I leave for Kenya I’ll be releasing See The World, Twenty Lessons for Stronger Travel Photographs – it’s large (over 200 pages), beautiful, and in addition to as much as I could cram in about making better photographs about the places we travel, has interviews with Bob Krist and Art Wolfe, packing lists, thoughts on bags and tripods, and all the others stuff – but mostly it’s the stuff you won’t find online when you reasearch travel photography and you get flooded with platitudes. Look for it on February 11. Like my other eBooks, it’s a downloadable PDF and it’ll be on sale for the first week. I am curious to know if you take images with your mobile phone then edit and share. If yes, any thoughts to doing an eBook on your experience in the process and tips you can share for better photos with the camera that is always with you. Welcome home David! 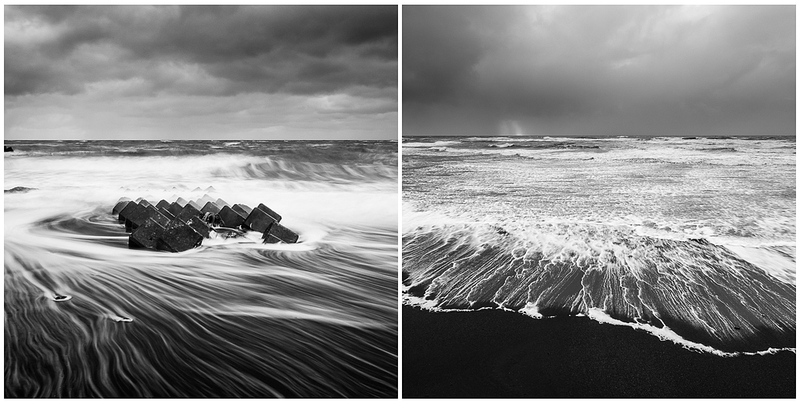 The last two square black and whites are simply wonderful. The white and blacks are just awesome! Sounds and looks like an awesome trip! Are the square BW images shot on film? Or cropped to square from digital? Many thanks! Hi Beth – I made these images as square frames in-camera. My Fuji XT-1 allows me to be very specific about the crop. That eighth image is quite phenomenal! The flowing lines, the processing, the framing, I dig it, David. What is it that you learned from this trip or doing (a bit) differently compared to the time before this trip? Hey Dave, great images and story. I always look forward to your stories and miss you when you’re gone for too long. Looking forward to reading “see the world”. I love the direction your work is taking. The minimalist style lends itself to the square, black and white format. I’m looking forward to seeing more. 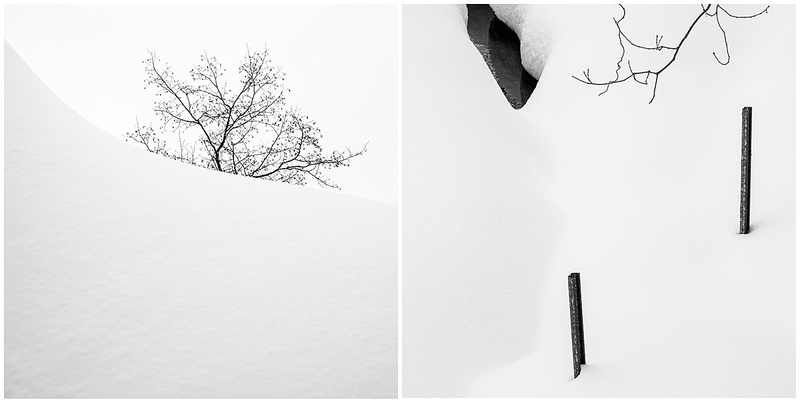 Beautiful images – I especially like the sparse, empty beauty of the snowscapes with trees. I’ve been thinking a lot about wabi-sabi too lately – and it’s great to see the concept expressed in your pictures. Thanks for yet more inspiration! It’s the two lines of fencing with trees forming then the vertical which I really love – so nice to see the square format also. 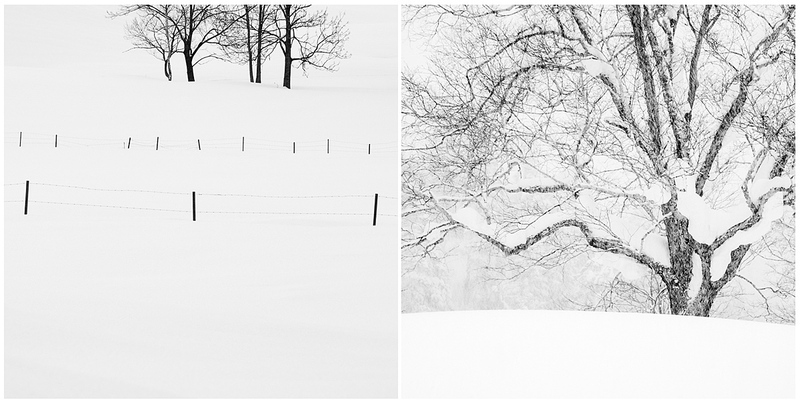 Quite beautiful images, especially like the one with the six trees, separated by a space. Forgive my ignorance, but what is the deal with the crosses or x’s in the first image? Hi Tom, thank you. I should have explained. 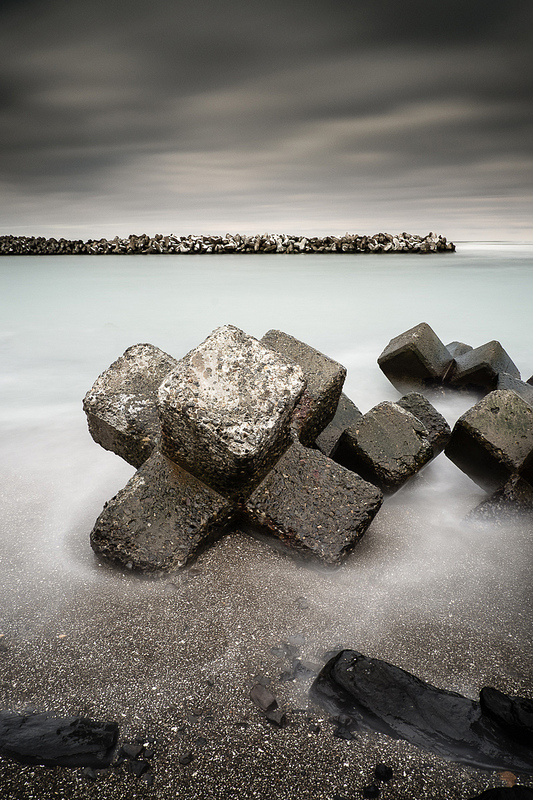 Those are tetrapods – concrete wave breaks placed along the coast to protect from erosion. So enjoyed following your adventure on Instagram and now seeing the final results. Your photography has made me so excited about visiting Hokkaido one day! Can’t wait to purchase your newest book. Just in time before I leave for Nicaragua to photograph a surgical mission. Thank you!